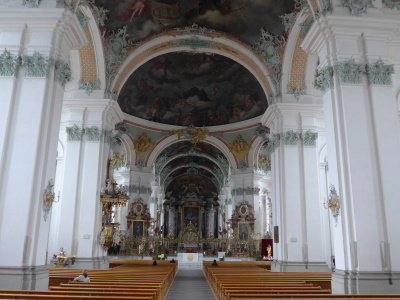 The Abbey of St Gall had a great influence on the development of monastic architecture and is considered to be a typical example of the large Benedictine monastery. The beginnings of the monastery can be traced back to 612, when the itinerant Irish monk Gallus had established his hermit's cell in this valley. The area soon became a centre of cult-worship. In 719 this blended into a monastic community, where the Regula Benedicti was introduced. It was during the abbacy of Gozbert (816-837) that the so-called Golden Age of St. Gall began. Most impressive remains of this period are the Convent's library and archive, containing 150.000 books including numerous treasures. I went here on a Sunday morning, not the best day to visit because the cathedral was closed for visitors. So I walked around the convent's complex instead. It's really huge, with buildings in several styles. 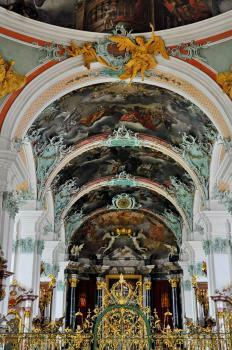 The center of the town of St. Gall is worth a stroll also. Especially the carved 'balconies' that are attached to the houses. I visited this WHS in June 2014. Having visited quite a number of monasteries and abbeys in Europe before, I wasn't impressed by the huge complex of churches, chapels, gardens, monastery buildings, etc. especially since they seemed to be relatively new or heavily restored and my first impression was "this is just another abbey like many other on the list". However, I left the Abbey Library for last and what a pleasant surprise it was. I spent at least 2 hours gazing at the pristine library full of old parchment books, an original mummy and a sarcophagus from the Hatsheput Temple in Egypt and a replica of a gorgeous globe (the original is housed in a museum in Zurich). For 12 euros, I got the entrance ticket with the very informative audio guide, wore special footwear over my shoes to protect the wooden floor and for most of the time I had the magnificent place to myself. That said, the number of visitors at a time can be around 100, so it's best to avoid weekends, public holidays or peak hours. I could have spent more time just gazing at the wonderful library as the only downside was that of getting a stiff neck! The library alone to me has OUV and is a jem everyone should behold! Since ancient time Sankt Gallen, the capital city of the canton of the same name, was well known for its magnificent abbey which was one of most important monastery in this region and was on my wish list to see for a long time. During my Switzerland tour, I took the Voralpen scenic train from Lucerne to Sankt Gallen, the scenery of pre-alpine region was really pretty and I highly recommended using this train as a mean of transportation to enter the city. From the train station, it was very easy to reach the abbey by just walk along the lovely car free shopping street until you started to notice the huge complex on your right. The complex was very large with many buildings built encircled the cathedral. Actually I was quite disappointed with the complex's exterior, apart from the cathedral; these buildings were really plain with nothing significant to mention. The unbelievable greenish lawn and the two towers of the cathedral apse were the things to see. However for cathedral's interior, I was really impressed with the beautiful Rococo style and in my opinion, the green stucco decorating the naves were very unique as I had never seen this color in Rococo decoration before. The monastic library was another highlight of this abbey, hiding in the very plain building both exterior and interior which made me not sure that I was in the correct place, but when I worn the big slippers, for protecting the wooden floor, and entered into the library, I was overwhelmed by the beauty of one of the most beautiful library in the world. The style of library was also Rococo with amazingly beautiful bookshelves and wonderful white stucco around the ceiling fresco, a real jewel of Switzerland. Sadly that photograph was not allowed. I really enjoyed my day in Sankt Gallen, this city was a very nice place to visit, and the abbey was deserved to be a UNESCO World heritage Site. My only regret was that I had to cancel my plan to visit Richenau of Germany, another monastic WHS that claimed to have strong link with the abbey of Sankt Gallen due to the shopping street was very tempting with many local and international brands! But this maybe a good reason to revisit this area again in the near future! When my flight to Malta and its 3 WHS was canceled because of the volcano, I made a nice train trip instead to St. Gall in Switzerland. It is a medium-sized town with a very pleasant centre full of historic buildings and half-timbered houses. The religious complex in the immediate city centre, consisting of the cathedral and the convent, is a World Heritage Site. Both buildings have a medieval (Carolingian) origin, but were heavily rebuilt in Baroque style. Both are quite nice, but the unmissable part is the library. You can actually only visit one room, but it is full of books and manuscripts that are up to 1,200 years old. A must-see for any history buff. 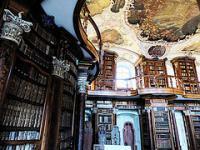 The greatest thing about St Gall is its old world-known library. It is of immense historic value and still contains unique manuscripts. Otherwise, the medieval monastery was heavily modified to suit the Baroque taste and the result I do not find that impressive. I used to live in Rorschach where my parents still reside. I was born in Thal (SG) in 1961 and went through my entire schooling in Rorschach and as well in St. Gallen for 4 years. I also worked in St. Gallen for 6 years. St. Gallen is an old city with many things to be seen and not only buildings but also vantage points with beautiful vistas over the city. The centre of the city is naturally grown and has countless old buildings to offer. Have a look at the Stickerei Museum (the embroidery museum). This will give you a very deep insight of how the industry evolved and still is to this day. Amazing! If you fancy great views over the city take a quiet walk on the crest starting at Drei Weieren (Three ponds) which used to be and still is a public swimming area dating back to the old days where the sexes were kept seperate. There is also a minigolf up there where you can enjoy drinks, and say hello to Felix. The very best infromation you will get is when you go to the Verkehrsverein near the Hauptbahnhof (Central Railway Station). They will supply you with everything needed to be able to see the beauties of St. Gallen and the nearby regions. From "Convent of St. Gall" to "Abbey of St. Gall"
Magic Squares: St Gallen Library, "in the far southeast corner you'll spot The Venerable Bede, a seventh-century English monk from Northumbria who wrote one of the first histories of England: he is shown as a scholar, with, beside him, a magic number square..."
Musical Notation: Codex St Gall is among the earliest examples of Western neumatic notation. Located in a Former Capital: Convent of St. Galle is located in St. Gallen which was a capitol city of independent principality in 13th century.